You hear that defiance is normal for kids, from toddlerhood to the teen years, but that doesn’t make it any easier. Especially when simple rules and responsibilities provoke power struggles. Why are choices powerful? They provide your child the autonomy to decide how she wants to do the task. No doubt she needs to do the task, and she might even resent that she has to do it. But given the autonomy, she’s more likely to comply when the choice falls on her. Notice that the choice isn’t “either / or.” You’re not giving her the choice to put the dishes away or not, because she needs to put those dishes away. Instead, you’re giving her the choice of how or when she gets to do them. And always provide parent-approved choices—you should be happy with either choice she makes, not use them to pit one against the other (“Do you want to put the dishes away or not go to grandma’s?”). All your child needs to comply is to feel heard. Show empathy by saying you understand how she feels and letting your body language express that you’re on her side. 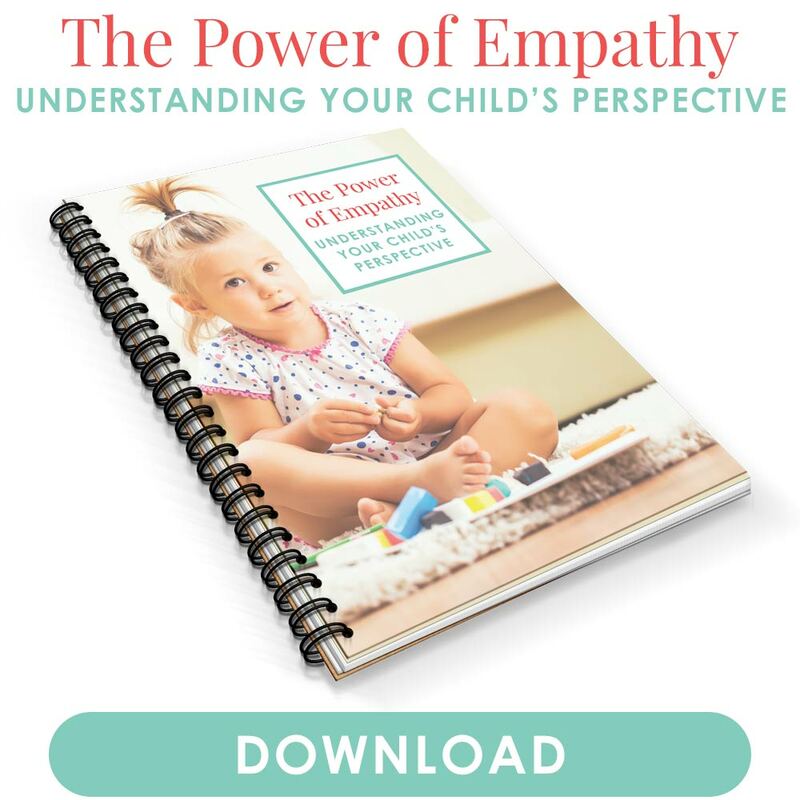 With empathy, your child knows you understand how she feels and that you would even feel the same way in her shoes. When phrased as a privilege, the chores become something they get to do. My son loves spraying and wiping surfaces in the house because he thinks it’s awesome to spray things. Well, there you go—I just got him to do chores. The focus is on the “after” part—the fun part—and less on the means to get there. The chore isn’t the big battle and power struggle, but something to do so she can move on to a fun activity. If you’re like me, it’ll be a lot. And for the most part, we have to. We’re parents, and we keep kids in check. We provide boundaries and show them appropriate ways to behave. But can you imagine living under those circumstances? It’s tough being a kid sometimes. And we have to remember that when we’re on the brink of another power struggle. Instead, be particular with which behaviors need correcting and which ones can stand to be ignored. Kids, like all of us, have a limited amount of space to be disciplined for it to be effective. Focus on the best lessons and leave the rest. Now the focus is on being a helper, rather than being bossed around. She’ll feel more independent knowing she’s helping you out, not just obeying orders. Plus, you emphasize teamwork. She’ll feel that her contribution is something essential to the family unit and will feel proud to take part in it. Listening to our kids and their endless “no’s” is challenging for any parent, but with a few changes, you can get your child to comply more often. Offer choices so she feels more autonomous and independent in her decisions. Show empathy to diffuse power struggles and let her know you’re on her side. Phrase the task like you’re asking for help and encouraging her to contribute on her own. Provide a better option and give “perks” that come along with doing the job. 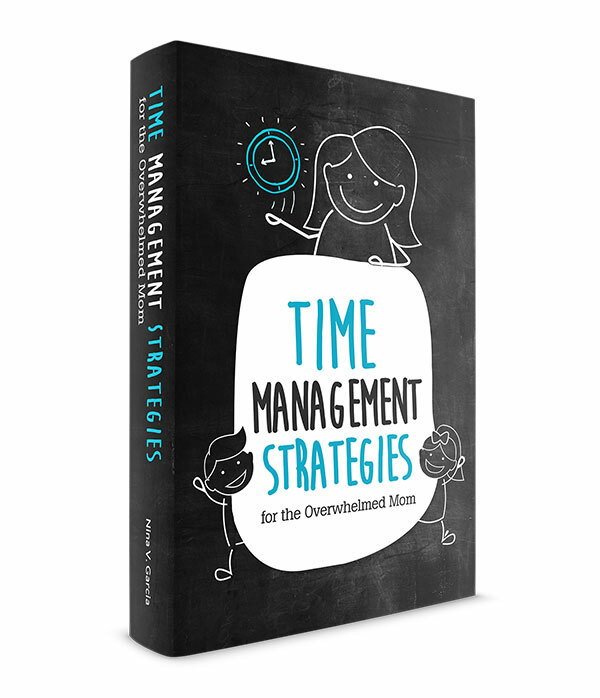 You can also highlight an incentive, or a positive consequence to getting the task done. And when all else fails, pick your battles and see which behaviors need most correcting and which you can let go. Kids will at some point say “no” to your instructions and requests. Now you have the tools to better communicate and encourage her to comply, starting with putting her dishes in the sink. 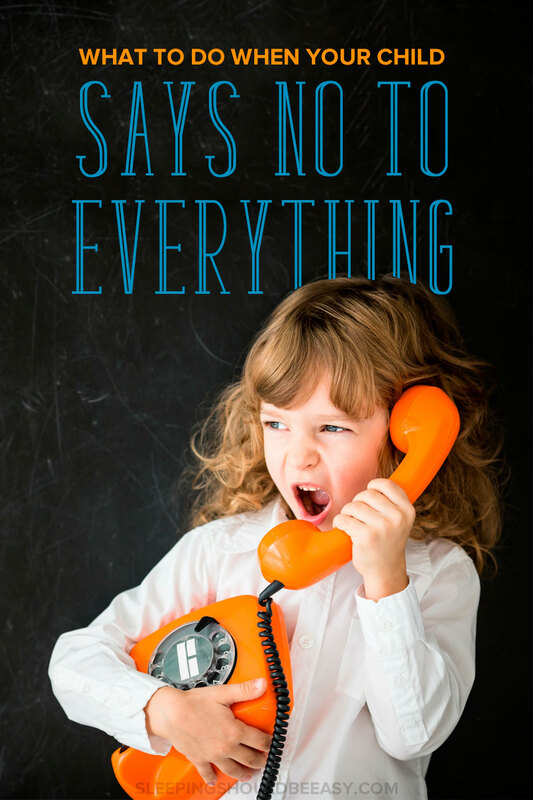 Your turn: What do you do with your child saying no to everything? How do you convince your child to follow the rules? When do you know to stand firm or let them ‘win’? Let me know in the comments! I can no longer convince my kids that chores are fun at all – tough to do with teenagers! But I still pick my battles, and explain to my kids that I am compromising with them on this one point, but I will not compromise on another. These are great tips for younger kids, and sticking with them will pay off in the long run. Darn, I knew it had to end eventually Dana lol! It amazes me when my kids fight over who gets to wipe and dust. I think it’s smart of you to explain to your kids that this is a one-time compromise. That’s a good point to mention! Great advice, as always, like offer them choices to be in control, say “no” but in a positive/re-directing way, and play to their strengths like wanting to please others and being helpful. Lately, I’ve been teaching my 4 yr old about compromise since he’s pretty stubborn. I hope to teach him that we can’t always get our way, but we can always try to meet in the middle. This way, no one loses. Thanks, Lisa! That’s great you’re teaching your son to compromise. I don’t think it’s lessening our authority; rather it teaches them how to compromise correctly and that yeah, like you said, people can meet in the middle instead of it being so black and white. Thanks for devoting a whole blog post to my question! I’m going to try all of these tips. I have used some weird reverse psychology around chores lately, like saying to my 4yo “I wonder if you’re tall enough yet to place those dishes in the sink?” Then she tries like hell to prove she is! Ooh awesome, Amy! That’s a great way to get it done. Adds a bit of challenge and extra motivation so that the chore isn’t so much a chore anymore. Nice! I have a lot to learn. Thank you for this practical tips! Indeed, the way we say things really matter. I like the “giving choices” tip. I believe it’s effective. My son pretty much follows things that I ask him to do. It’s just that he’s not very consistent. I’m glad though that he proactively washes his hands after going to the rest room. That’s great, Rea! I don’t think every kid can ever be always consistent, but that’s awesome he pretty much does what he’s supposed to. Offering incentives like that (we can play X after we clean up from dinner) has been hugely successful in my house lately. I was getting sick of having a mess in the kitchen after the way-t00-long bedtime routine, so I just decided we were going to get it done while the kids are still awake. After all, I don’t want them to think there is a cleaning fairy who does all this and they never have to! I’ve been doing that myself too Sarah. I used to always do everything when they were asleep but decided to start doing stuff while they awake. I like it because it saves time and like you said, the kids don’t think things magically appear. I love offering choices (but not many) and showing empathy. That seems to work with my five-year-old. The 2.5-year-old is honestly still delightfully up for anything. I wonder if that will change when he’s three..
Isn’t it crazy how kids can have different temperaments? My kids are pretty game for stuff and will listen, but they can be very different in other ways. Praising positive actions is super huge around here too Leslie! And yup, I totally point out when they do things without me asking—because it really IS a cool thing for them to do. Such a great technique to keep good habits coming. My mom taught me that toddlers say no because they see it as a way of keeping their options open. It feels a lot less defiant when you see it that way! Giving choices goes a LONG ways. I also find that tired kids are more defiant kids, so making sure they are well rested is key. I never thought of it that way, of toddlers saying no to keep options open. Now that I think about it, I can see how that can be true! Our 4 yr old disregards the choices we give her and always chooses something that isn’t offered and is almost always non-parent approved, as if she’s deliberately forcing an impass. Take bedtime for example, she says she wants a story, which is fine (she always has a story) but when it comes to it, she refuses to chose one. We can go through the whole library of books, multiple times, without her chosing one, until eventually it’s way padt her bedtime and we have to resort to just picking one, which she rejects and we have to go through them again. At which point she says she wants 3 stories. We put our foot down and say its late, if you want a story im going to count to 5 and if you haven’t got one in your hand for me to read, you won’t get a story. By 4 she has grabbed one, but while reading it to her she’s huffing and puffing to show she isnt happy. Once the story is over she has a tantrum because she “isnt tired”, when she clearly is. She then finds any excuse to keep us talking so she doesnt have to go to sleep. If we leave she screams the house down, saying the bed is uncomfortable, her blanket is wrong, she doesnt like having her baby brother in the next room, shes got a booboo, etc. And its not just bedtime, every morning we get a similar thing before nursery where she doesnt like any of the clothes we give her to chose from, all her socks feel wrong, she won’t wear a jumper or coat because they make her arms itchy, then she has a full on tantrum about wanting to stay at home because she hates nursery, even though she’s fine there once we’ve left. The delaying tactics are so bad that eventually the only think we can do to leave the house is pick her up and put her in the car then fight to keep her seatbelt on. The stress is horrendous. Oh Bevan, big hugs! It does sound stressful, especially going through that day in and day out. I think you’re right—you’re daughter is sensing the power struggles and is upping the ante each time you make an attempt to offer a choice or discipline. I think the key in this case is to put your foot down at the first choice. Let’s start at the beginning and let’s say she wants a story. She can either pick a story quickly, or you pick one. If she doesn’t pick one quickly, then pick a story for her and end it at that. If she’s throwing a fit or huffing and puffing because she doesn’t want the one you chose, then you can say she can either enjoy the story with you or go straight to bed. And it’s important to follow through with what you say. Don’t let her convince you to let her pick (and spend 10 minutes doing so). While all of this is going, it’s also important to watch your own tone of voice. I like to tell parents to act as if this doesn’t ruffle their feathers, that it’s no big deal, that you’ve got it. If she senses that you’re upset or stressed, that only makes her feel just as upset and stressed. Think of this as her problem, not yours, basically don’t make her problem yours. If she can’t have a story because of the way she has behaved, then that’s too bad for her, hopefully she’ll get one tomorrow. You’ll also want to keep your tone of voice calm and kind, and remind yourself that you’re both on the same side here. You both want her to enjoy a story and cuddle at night, not go into a battle where one of you tries to win.